I have this feeling that 2012 may go down in history as the last gasp of classic rock artists releasing new albums. These guys are getting seriously old now, and if they’re not dying off most have lost it when it comes to their playing and performance. And of course, rumors persist that major labels are going to 86 compact discs soon, in yet another last-gasp effort to cut costs and keep the lights on for a few more months. But it’s been one hell of a good year for such releases so far, with excellent new material from Bruce Springsteen (Wrecking Ball), Van Halen (A Different Kind Of Truth), and Rush (Clockwork Angels). Even Mr. Mercurial tossed together a new album with Crazy Horse (Americana) that isn’t half bad – at least not when compared to much recent Neil Young. Oh yeah, and Jethro Tull’s Ian Anderson released a sequel to Thick As A Brick. 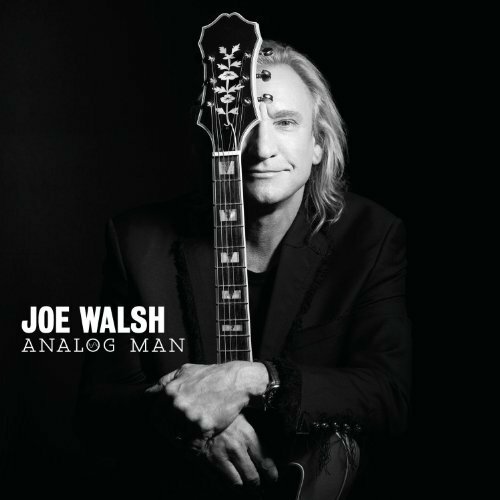 And then there’s Joe Walsh, who for some reason decided to issue his first studio release in 20 years. Analog Man is the title, and though better than Thick As A Brick 2, the album is disappointing for many of the same reasons. This collection of music qualifies as little more than an EP, really, a trifle. At just over 36 minutes on the standard release, including two of filler (on “Funk 50,” which is just what it sounds like – a continuation of “Funk 48” and “Funk 49,” though not as interesting), Walsh certainly isn’t convincing anyone that he’s overflowing with things to say. A “Deluxe” edition of the album adds about 10 minutes of music, a single new song and a lengthy live James Gang track from 1970. So what has Walsh been doing for the past two decades if not writing or recording new music? Apparently getting sober and getting married and, of course, playing guitar in the Eagles and on other people’s albums, like Ringo Starr’s. While these are fine and noble pursuits, they haven’t resulted in particularly strong material for Analog Man, which seems dashed off and incomplete. While Walsh will never be mistaken for Dylan, it would be nice if there were more cuts like “Wrecking Ball,” a rocking tale of the self-absorption that passes for normal in today’s society. (This standout might have been a good one for the title track, but Springsteen beat Walsh to that punch.) “Analog Man” isn’t nearly as focused or strong, because even if it might have catchier hooks, the lyrics are as clichéd as you would expect in a song with such a title that was penned by a senior citizen. But even the title track isn’t as bad as it gets – that would be “Spanish Dancer,” a song about – get this – a mysterious Spanish dancer with captivating eyes. Ugh. Between the sophomoric lyrics and Jeff Lynne’s overproduction, this one is unlistenable, despite having a nice guitar solo trapped in its belly. “Lucky That Way” is a bit better, something of a sequel to “Life’s Been Good,” though it lacks the sarcastic humor of “My Maserati does 185/Lost my license/Now I can’t drive.” But Analog Man does include two or three other nice cuts and it’s always fun to hear Walsh’s characteristic guitar playing, which is in full force here. “One Day At A Time” is the best song to carry Jeff Lynne’s sonic imprint, with horns that make the song a celebration of Walsh’s battle with alcoholism despite the heartfelt and personal lyrics. My favorite track on the album is it’s final one, “India,” the only truly modern sounding music included. This instrumental jam is full of synthesizers and dance beats and also contains the best guitar work on the album. It comes off sounding something like Umphrey’s McGee, so I expect most Walsh fans – certainly the ones excited that David Crosby and Graham Nash phone in some background vocals on “Family” – will likely skip past it, prematurely ending the Analog Man experience. If we were still living in the era in which most major label artists were expected to release an album every year or two, Analog Man might make sense. It would be one of those records that gets made as much to fulfill a record company contract as it does to sate fans hungry for product. The critics would give it two stars and a single would get released, perhaps even cracking the Hot 100 before the artist headed back into the studio to work on the next one. But that’s not the way things work anymore. I fail to understand why anyone who hire Jeff Lynne in 2012. He hasn’t produced a hit in two decades and the material he did produce 20 years ago is seen as horribly dated and terribly overproduced. This review could have simply stated “The new Joe Walsh album was produced by Jeff Lynne” and I would have known enough to figure out it sucked old balls.